This entry was posted on August 28, 2017 at 7:00 am and is filed under California, New World, United States. You can follow any responses to this entry through the RSS 2.0 feed. You can leave a response, or trackback from your own site. We have been members of Dave & Marc Caparone’s wine club for more than 20 years and have never regretted one bottle of their only 100% varietal offerings. Amazing quality and longevity in the cellar at more than reasonable pricing even with shipping. We visited the winery in 2010 to pick up our club shipment once (as we normally have it shipped to Ferndale, WA) and were pleasantly surprised at the family operation (which now has a couple of more winemakers in training we hear). Dave also has a small classic car collection which he showed us proudly and we enjoyed immensely as we have a couple of those ourselves (life can’t always be about wine, you know). 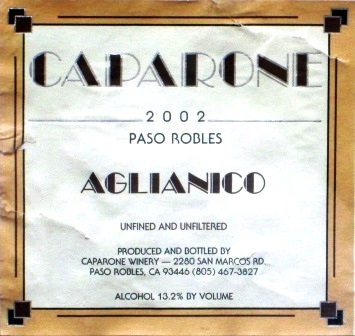 All in all, Caparone Winery is one of the finest producers of the hard to find 100% varietals that originated in Italy. Hi, Magda: Nice to hear from you. I had known there was a Paderewski connection to Paso Robles, but not that it was so strong and tied to wine. Thank you for that information: another reason to visit Paso Robles. 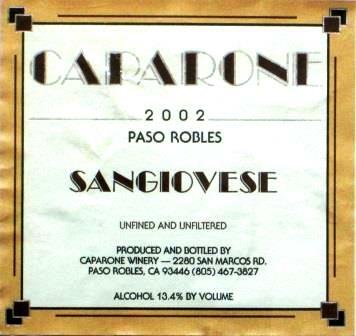 Please try the Caparone wines: I think they’re fine. My best to you and yours (your daughter must be a grown woman by now, no?). Thanks to your tip, Tom, I’m one of the very few New Yorkers who have visited Caparone, and tasted the three varieties. I am completely in agreement with you, and with Kerin’s reactions to these amazing wines at ridiculously low prices and low alcohol.. I too had given up on Italian varieties in CA until I visited Caparone. The Aglianico is amazing, the Sangiovese the best by far from CA. The Nebbiolo, probably the most difficult to grow out of its home region, Piedmont, was quite good, imo.but not quite up to the Aglianico or Sangiovese. It was a noble effort, and I enjoyed it, but probably my standards for Nebbiolo are too high. (I did drink the whole bottle of each one, however. The Nebbiolo was still drinking well the next day). Thank you for turning me on to Caparone (I visited about five years ago). At that time, Dave Caparone was not shipping to other states; not enough wine. But I do strongly encourage your readers to visit Caparone when they visit CA. A pilgrimage you will not regret. And the whole area around Paso Robles is beautiful. Lots of reasons to visit, of which the wines are far from the least. Tom – Very interesting article – your conclusions are different than I expected when I open your note. 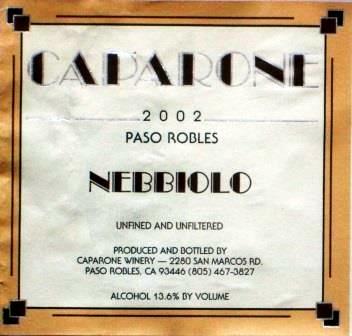 Are you aware of availability, particularly the nebbiolo in CT or NYC? Thanks again for a fascinating find! At the moment, I don’t know about Caparone’s east coast distribution (I’m trying to find out). I do know you can order directly from the vineyard: Just google Caparone Vineyards. Great article Tom – it definitely has me interested in trying these wines and others from this producer. I’m impressed by the balance you report, and by the restrained alcohol levels declared on the labels: 13.2%-13.6%. Not only are these surprising for California, they are now almost unheard of for these varieties in their respective growing zones here in Italy, with the exception of some of Alto Piemonte Nebbiolos. I’d love to know how the recent vintages compare in style to the ones you just tasted from 2002. If you do try more recent vintages, please be sure to let us know. Cheers! Thanks, Kerin. I do plan to try some more recent vintages, with an eye toward updating this post. I think this is a very important small producer. You are of course completely right about the significance of those alcohol levels: They account for a great deal of the perceptible restraint and elegance of these wines. And all of those — low alcohol, restraint, elegance — are rarer and rarer qualities these days, in Italy as well as California. As I’m sure you know even better than I.